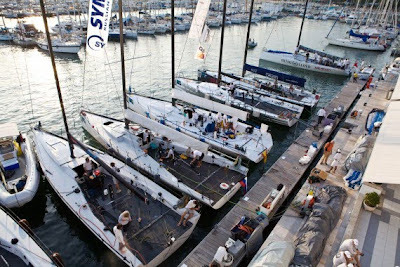 The fleet for the 2009 TP52 World Championships has mustered at the RCNP ready for racing to begin on Wednesday, with the practice race Tuesday. With two days to go before the official practice race for the TP52 World Championships on the at the Real Club Nautica de Palma in Palma, Mallorca the ten boat TP52 fleet is already assembled and most have today been taking advantage of the very pleasant autumn sunshine and light winds. The ten boats are at the Club’s dock this evening, with France’s Paprec Recyclage and Britain’s Henri Lloyd Weapon of Choice mooring during the early evening. Racing on the Bay of Palma starts with the practice race on Tuesday, leading in to a diet of up to 11 races which is scheduled to include a coastal race Friday which carries the customary 1.5 times points bounty. Boats for which this regatta is on ‘home’ waters include Bríbon (ESP), Cristabella (GBR) and Matador (ARG) although most of the crews know the waters of the Bay of Palma very well. Racing for the world championship title in effect starts on Wednesday scheduled for just after 1300hrs local time.